Signature :Dewa Daijo Fujiwara Kunimichi. 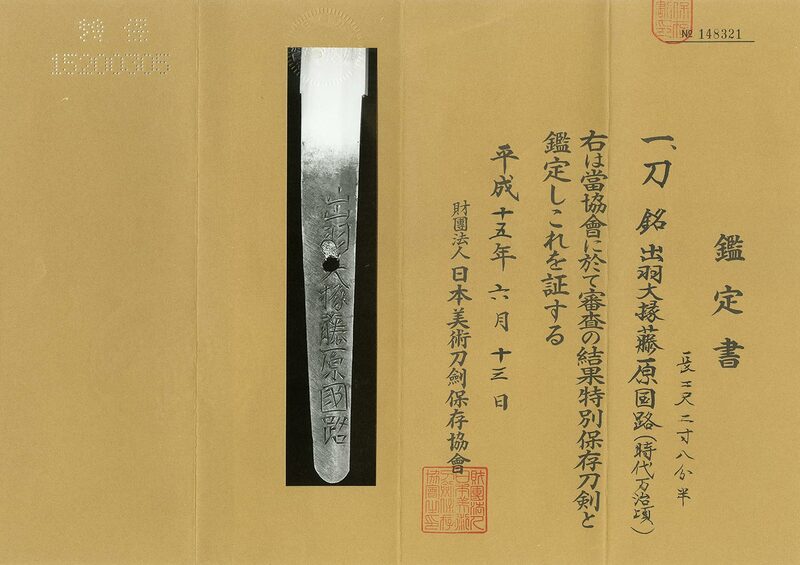 This sword belongs toJyoJyo saku ranking. Blade length :　69.4 cm or 27.32 inches. Sori :1.27 cm or 0.5 inches. Width at the hamachi :2.925 cm or 1.15 inches. Width at the Kissaki :2.14 cm or 0.84 inches. with suitable sori and longer kissaki. it is visible to see the texture well. midare with sunagashi, kinsuji scatter in Ha. Habuchi is soft feeling and boshi is sansaku style. Kunimichi the First learned under Iga (No) Kami Kinmichi and Horikawa Kunihiro. It is thought that Kunimichi was designated Dewa Daijo in 1614 to 1615. His latest work was 1657. Most of his swords show fascinating hamon with strong Nie and Nioi. This elegantly-proportionedsword shows distinctive features of his workmanship. Especially the texture of jitetsu outstrips one of his masters Horikawa Kunihiro’s. Saya :Brown black color kawarinuri saya. Tsuba :On the round shape syakudo tsuba, painted by gold color. Menuki : frags are made by syakudo plate. and his swords are loved by many sword collectors for Soshuden. This work is very healthy and resembles Kunihiro in Jigane. Koshirae is nice well balanced with sword.